In November 1888 two young men, employees of the Post-Intelligencer newspaper in Seattle, quit their jobs and went into real estate. They didn’t have any formal training in such work but their knowledge of the city and their belief in its potential led them to launch out into the buying and selling of land. Just six months later, Seattle’s Great Fire of June 6, 1889, caused an explosion in the value of real estate and in the potential for expanding and developing new areas of the city for industry and for housing. Samuel Crawford and Charles T. Conover were on their way, and became one of the best-known and trusted names in real estate and development in Seattle. Real estate office of Samuel Crawford (seated at left) and Charles T. Conover (standing, center) in 1890. Walter Hamley, age 12 (seated, at center) worked as a messenger. Photo courtesy of University of Washington Special Collections, PH Coll 503.8. The remarkable story of Crawford & Conover had parallels forty-seven years later in 1935, when Albert Balch and Ralph Jones left radio work to go into real estate. Like Crawford & Conover in the 1880s, in the 1930s Balch and Jones were bold and optimistic that they could overcome a “down” economic climate. Incredibly, when Balch and Jones first started out, the real estate firm of Crawford & Conover was still operating. Samuel Crawford died in 1916 and Charles T. Conover began the process of retiring from business at age 74 in 1936. Conover lived to be a very old man, dying in 1961 just two days before his 99th birthday. Albert Balch was one of the honorary pallbearers at the funeral of C.T. Conover. In 1941 a newspaper article announced that C.T. Conover would sell his real estate firm to two young realtors, one of whom had been well-known as an athlete at the University of Washington. However, in the next three years there were no newspaper real estate ads with the name of Crawford & Conover. We can speculate that the years of World War Two interrupted the plans of the purchasers or that they changed career directions. Perhaps the sale did not actually go through. As of January 1944, Albert Balch was official owner of the Crawford & Conover company name. He began using the company name Crawford & Conover concurrently with Albert Balch Enterprises and the Wedgwood Corporation, showing that he had divided the different functions of building and selling houses under separate corporate names. At left, the Seattle Audubon office at 8050 35th Ave NE was originally Balch’s office. At right is the office for Crawford & Conover Real Estate with the C-shaped sign in front, used today by the current businesses. Why did Albert Balch choose to use the name of Crawford & Conover, instead of just his own name, to represent real estate sales? In news articles Balch stated that his intention was to continue the pioneer heritage of Crawford & Conover, since Balch himself laid claim to pioneer family roots in Washington Territory. Crawford & Conover had “name familiarity” and especially so in north Seattle where the company had filed many plats. 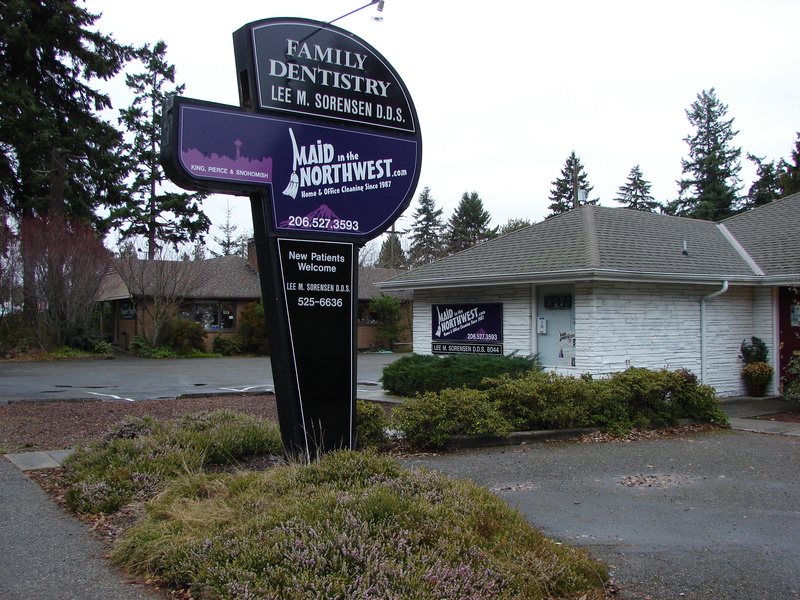 In 1949 Balch established his new office at 8050 35th Ave NE in Wedgwood (present site of the Seattle Audubon office and nature shop), but he soon needed even more office space. He expanded into 8044 next door in about 1951, designating that building as the real estate office, and he set up the C-shaped sign with the name Crawford & Conover Real Estate. Balch offices in 1962, with the Crawford & Conover real estate sign at right in front of 8044 35th Ave NE. Photo 76719 Seattle Municipal Archives. Ever mindful of “good PR” (public-relations), Balch got an unexpected opportunity to affirm the integrity of the Crawford & Conover heritage in February 1948. Someone who was going through estate papers in Olympia, Washington, found a check dated June 7, 1915, drawn on the bank account of Crawford & Conover and made out to C.A. McKenny in the amount of $10.65. The check had never been cashed. Balch had become signer on the Crawford & Conover account at the National Bank of Commerce, and when told about the check he ordered that it be honored, even though the check was nearly thirty-three years old. In 1948 Balch contacted the “Strolling Around the Town” human-interest column of the Seattle Daily Times, which printed this news item about the check dated in 1915. Names which I found listed on the Washington Digital Archives indicate that the check probably belonged to Cynthia Adelaide McKenny, widow of Thomas I. McKenny. The couple came to Washington Territory in 1870 and T.I. McKenny’s occupation was “real estate dealer.” The uncashed check may have been for work done or a sales transaction with Crawford & Conover. Crawford & Conover advertisement in the Seattle Post Intelligencer newspaper of October 7, 1901, page 12. The above news item about the McKenny check might seem to be a self-promotional effort by Balch. But Balch knew that one characteristic of a successful salesman was integrity, and through items such as the McKenny check, which he ordered to be honored, Balch sought to show that his company operations were fair and delivered upon what was promised. In this way Balch would enhance the reputation of his real estate operations to create trust. Another characteristic of a successful salesman is the ability to look ahead and anticipate the needs of customers. During the years of World War Two in the 1940s, house-building was difficult because of restrictions upon materials. For example, instead of producing nails, industries were churning out guns and bullets for the war effort. But Balch confidently looked ahead to the war’s end and he positioned himself to build more houses for returning servicemen who would want to settle down with wives and homes. Balch planned ahead by acquiring available tracts of land which he would be able to develop after the war. As of the 1940s in Wedgwood there were still enormous undeveloped tracts of land. Some had been held for a very long time, such as vacant land owned by the Fulton family since 1911, present site of the QFC grocery store at 8400 35th Ave NE. Finally Balch was able to acquire the land in 1942. He kept the QFC corner at 35th Ave NE & NE 85th Street as a commercial zone to be developed later in the 1950s. Balch was not a commercial builder but he knew that having shopping and other services near to his housing developments would meet the needs of new residents and would give the neighborhood its center. To the east of 35th Ave NE, in September 1944 Balch platted the land from NE 82nd to 85th Streets as Wedgwood No. 2. He built houses there on the same plan as the original Wedgwood with curving streets, complete with curbs and sidewalks. He also set up ornamental gateposts at the corner of 35th & 82nd to mark entrance to the development, just as he had done on the west side of Wedgwood in the original development. Wedgwood No. 2 was begun before World War Two was quite over, but Balch, with his ever-present optimism, believed the end of the war would come soon and he would be ready with houses for returning servicemen. After the war, Balch’s optimism proved to be justified as the housing market exploded with demand. In 1948 Balch began platting Wedgwood Park a little farther east of 35th Ave NE. Another characteristic of a successful salesman is teamwork. Far from being a loner and trying to keep his success to himself, Balch gathered a team of experts around him. He knew that he alone could not handle the many facets of real estate development, including engineering of streets and lot layouts, the building of houses with all interior finishes, the sales work and financing. In her memoirs Balch’s secretary Ethel Madigan wrote that people often approached Balch with products that they wanted him to try out and to become a co-investor on the product. As a result Balch held patents on some construction products such as Wonderwall Structures, and some things which weren’t, such as Dorcana Cosmetics. Later in the 1950s, Balch built larger houses. This one was designed by Paul Hayden Kirk, built at 8022 28th Avenue NE in 1958. It is in the plat of Wedgwood No. 3. Along with Balch’s optimism and enthusiasm for what he was doing, Balch demonstrated a willingness to change and adapt to new trends. Since he had been so successful in his first development efforts (in View Ridge and the first Wedgwood houses) we might assume that Balch would keep doing the same thing in the same way. But Balch showed the ability to adapt his house-building program to changing times. Into the 1950s and 1960s Balch built houses with more bedrooms and bathrooms, with an area called a den or family room for watching TV, and with two-car garages. These were adaptations to changes in American life, including the rise in car ownership and in television-watching. Wedgwood Park advertisement in the Seattle Times newspaper on August 1, 1948. Balch’s old office address is shown. The next year Balch built a new office at 8050 35th Ave NE. The date of filing of the plat is the beginning of a housing development, but is not the same as the date of purchase of the land. For example, Balch purchased the land at the present site of the QFC grocery store, 35th Ave NE at NE 85th Street, in 1942. 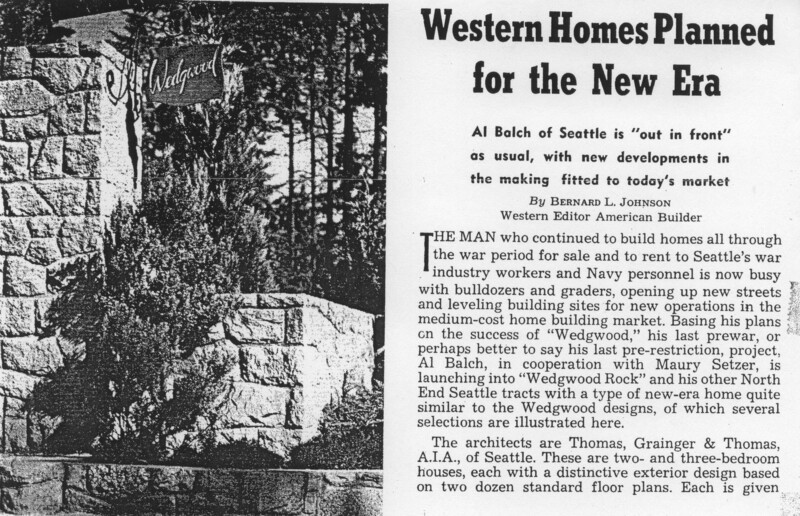 It was not until 1944 that Balch filed a plat, registered with King County, and began building houses on the eastern portion of that land purchase, which he called Wedgwood No. 2. The area closest to 35th Ave NE was reserved for commercial development as it is today with the grocery store, Wedgwood Broiler restaurant, and other stores. 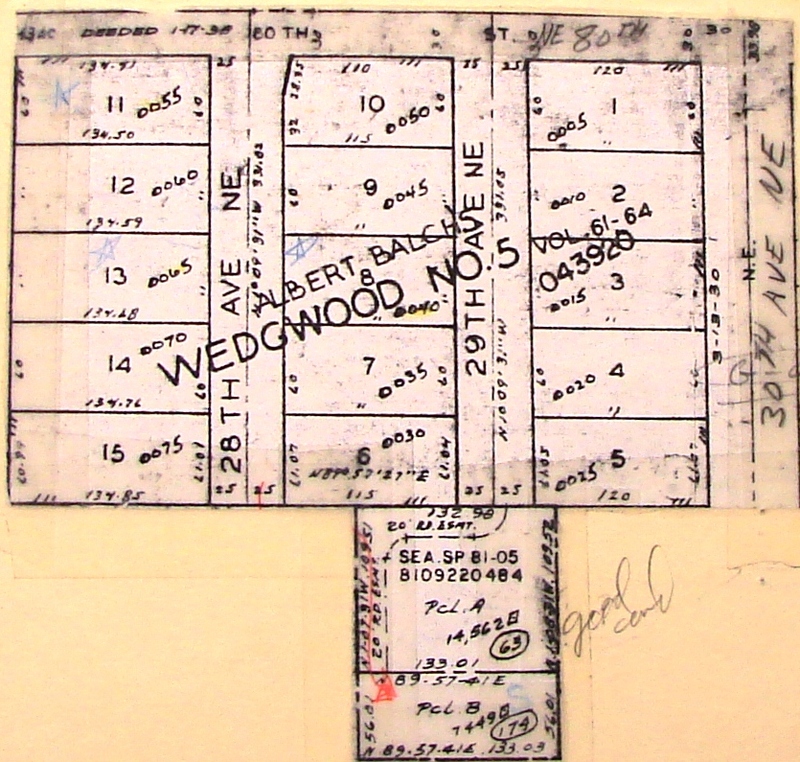 The original Wedgwood plat was filed in July 1941 for land from NE 80th to 85th Streets, 30th to 35th Avenues NE. This undeveloped forty-acre tract had been owned by the Jesuits of Seattle University since 1929. The land was sold to Balch after the Jesuits decided not to move the university to the site. Wedgwood No. 2: plat filed in September 1944 for land from NE 82nd to 85th Streets, 35th to 38th Avenues NE. In 1942 Balch bought this land which had been owned for thirty years by Walter Fulton. Wedgwood Rock Addition: plat filed in October 1945. This completely untouched forty acres had been owned by the Miller family for more than fifty years, comprising NE 70th to 75th Streets, 25th to 30th Avenues NE. Wedgwood Park: First filed in September 1946, this plat was only from NE 80th to 82nd Streets, 35th to 37th Avenues NE. It expanded over the following three years into a total of six additions, absorbing small land holdings until the plat extended eastward all the way from 35th to 45th Avenues NE between NE 80th to 82nd Streets. Wedgwood No. 3: Set on the hillside above today’s P-Patch, this land from NE 80th to 82nd Streets, 27th to 30th Avenues NE had been part of the Picardo Farm. The Picardos began selling “along the edges” of their property in the 1940s, and Balch platted this section in June 1946. There are forty houses in the plat. Wedgwood No. 4: Filed in January 1951, Balch had already started building houses in the plat when the School District came along and took one section for Wedgwood School. An L-shaped plat, Wedgwood No. 4 extends from Wedgwood School at the corner of NE 85th Street and 30th Ave NE, west to 25th Ave NE, then north to NE 90th Street. Plat map of Wedgwood #5. At the bottom of the map is a 1926 house not included in the plat. Wedgwood No. 5: This plat, filed in January 1959, has only fifteen houses on 28th and 29th Avenues NE south of NE 80th Street. There is a 1926 house adjoining the plat. The land was sold to Balch by long-time owner A.M. Lee. From the above list which is only partial, we see that Balch acquired enormous tracts of land in what is now Wedgwood in the 1940s and 1950s. Prior to that time the neighborhood had not really had a name. By the end of the 1940s, because Albert Balch had spread “Wedgwoods” everywhere, the neighborhood became known as Wedgwood. Continued: Albert Balch, Part Six: Architecture and Neighborhoods. Below: A 1946 article in American Builder magazine commended Balch for persevering with homebuilding in the post-World-War Two period, when there were difficulties with obtaining materials and there were a lot of government regulations to contend with. This entry was posted in Balch, name of the neighborhood, Plat names and tagged 1940s real estate development, housing developments in Wedgwood, housing plats in Wedgwood, Seattle, WPLongform. Bookmark the permalink.